 Mouse anti folate binding protein antibody, clone SF55, recognizes the folate receptor alpha, also known as folate binding protein (FBP) and Milk folate-binding protein. Folate receptor alpha is a 241 amino acid 30 kDa protein with a 19 amino acid signal peptide and a 7 amino acid c-terminal propeptide cleaved in the mature form. The folate receptor alpha has a high affinity for folate and several reduced folic acid derivatives and mediates the intracelullar delivery of 5 methyltetrahydrofolate. Membrane bound and soluble forms of a high affinity FBP have been found in kidney, placenta, serum, milk, and several cell lines. Mouse anti folate binding protein antibody, clone SF55 can enhance STAT3 activation through binding to the folatereceptor alpha (Hansen et al. 2015). Hansen, M.F. et al. (2015) Folic acid mediates activation of the pro-oncogene STAT3 via the Folate Receptor alpha. Cell Signal. 27 (7): 1356-68.